The Commissioner for Co-operation and Registrar, Co-operative Societies, Maharashtra State, Pune vide No. 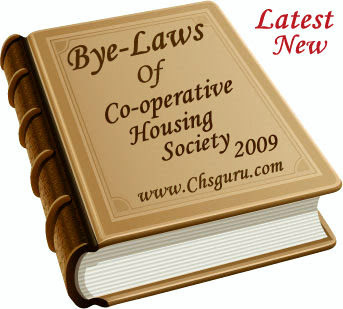 GRIHA/ D-3/ English/ Bye-Laws/ Printing/ 2010., Dated: 24th December 2010. Utilisation of the Repairs and Maintenance Fund. Modes of investment of funds of the society. Resignation by a Nominal Member, occupying the flat on behalf of a firm, company or any other body corporate. Resignation by a Nominal Member, who is Sub-lettee, Licensee, Caretaker etc. Resignation by a sub-lettee, licensee or caretaker. Procedure for Nomination by a member and its revocation. Recording of Nomination or revocations of earlier nomination. Transfer of shares and interest of the deceased member in the capital property of the Society to the nominee. Transfer of shares and interest of the deceased member in the capital/ property of the Society to the heir. Payment of the value of Shares and interest of the deceased member in the capital/property of the society to the nominee / nominees. Payment of the value of Shares and interest of the deceased member in the capital/property of the Society to the heir/ legal representative. Disposal of applications for transfer of Shares and interest of the member in the Capital/ property of the society. The Committee/General Body not to ordinarily refuse any application for membership or transfer of Shares and/or interest in the capital/property of the society. When application for transfer of Shares and interest in the capital/property of the Society, shall be deemed to have been rejected. Sub-letting etc. not permissible except under the Society's permission. Restrictions on assignment of occupancy right in the flat. Flats to be kept clean. Additions and alterations in a flat to be carried out with the Committee's permission. Application for permission and making additions and alterations in a flat. Examination of flats by secretary and report about Repairs to Flats. Notice to the member about carrying out repairs in his flat, by the society at its cost. Notice to the member for carrying out repairs to his flat at his cost. Restrictions on storing of certain goods. Not to do anything in a flat causing inconvenience, nuisance or annoyance to other members. Committee to take action on complaints about violation of the provision of bye-law No. 50(a). Grounds on which a member can be expelled. Procedure for expulsion of a member. Forfeiture of shares of the expelled member. Effect of expulsion on membership of the Society. Handing over vacant possession of the flat by the expelled member. Acquisition of the Shares and interest of the expelled member. Eligibility of the expelled member for re-admission to membership of the Society. Circumstances under which the person shall ceases to be a member of the society. Circumstances under which the person shall cease to be associate member. Circumstances under which the person occupying the flat on behalf of the firm/company ceases to be the nominal member. Circumstances under which a Sub-lettee, licensee, care-taker ceases to be the nominal member. Action by the Committee on cases of cessation of membership of the society. Holding of flats by member. Liability limited to paid up shares amount. Payment of the value of Shares and interest of a member or past member of the Society. Composition of the Charges of the Society. Break-up of Service Charges of the Society. Sharing of the Society's Charges by the members. Committee to fix Society's Charges in respect of every flat. Payment of the Society's Charges. Review of the cases of defaults in payment of the charges of the Society. Flat purchased is deemed to have been allotted. Change of user not permissible without the sanction of the Committee. Policy of allotment of parking spaces and stilts. Restriction on use of parking spaces, stilts. Marking of parking spaces or stilts. Eligibility for allotment of stilts or parking spaces. Eligibility for allotment of stilts or parking spaces by lots. Applications for allotment of stilts or open spaces. Payment of charges for parking of vehicles. Calling, on the first general meeting by the Registering Authority. Period of notice for the first general meeting. Nomination of a provisional committee by the Registering Authority. Recording of minutes at the first general meeting. Powers of the Provisional Committee. Period of Office of the Provisional Committee. Handing over charge by the Provisional Committee. Period within which annual general body meeting should be held. Functions of the annual general body meeting of the Society. When a special general body meeting should be called. Fixing date, time and place for a special general body meeting requisitioned. Notice of a general body meeting. Period of notice of a general body meeting. Quorum for the general body meeting. Holding of the adjourned general body meeting. Postponement of the general body meeting which cannot complete the business on the agenda. Chairman of the Society to preside over all general body meetings. Restrictions on attending a general body meeting by a proxy. Voting right of a member. How decisions shall be taken. Cancellation of the previous resolution of the general body meeting. General Body meeting to be the supreme authority. Management of the Society to vest in the Committee. Exercise of powers by the Committee. Action if the nominations received are less than the number of seats to be filled in. Disqualification for election to the Committee. Intimation of cessation of membership of the Committee. Restrictions on being present at the time of consideration of a matter in which a member of the Committee is interested and voting on such matter. Period of office of the elected Committee. The first meeting of the newly elected committee to be held within 30 days of its election. Issue of notice of the first meeting of newly elected committee. Custody of the records of the society. Handing over charge by the outgoing committee. Election of office bearers of the Society. Number of Committee meeting to be held in a month. Casual vacancies in the Committee to be filled in by co-option. The period of office of the member co-opted by the Committee. Resignation by a member of the Committee. Resignation of office-bearer of the society. Notice of meeting of the Committee. The Chairman of the society to preside over the meetings of the Committee. One member one vote. Decisions by majority of the Committee. Attending meetings of the Committee and recording their minutes by the Secretary of the society. Joint and several liabilities of the members of the Committee. Powers, duties and functions of the Committee. Powers of the chairman of the society. Books of accounts, Registers and other Books to be maintained. Other records to be maintained. Responsibility for maintenance of account books, registers, records etc. Limit for maintaining cash on hand. Payment beyond prescribed limit to be made by cheque and power to sign the cheque. Extension of time for finalization of accounts. Procedure to be followed before writing off any amount. Co-operative Courts of Mumbai recently Shifted to New address in 2019. Housing disputes tops in Consumer Court complaints List. The Supreme Court asked real estate developer Parsvnath Buildwell to pay Rs. 12 crore to flat buyers in its Exotica project in Ghaziabad within four weeks - September 2016. Possession delay, Consumer forum slaps Rs 1 Lakh fine on Unitech & refund Rs 13 lakh taken from the complainants and pay Rs 10,000 as cost of litigation - 2016. Supreme Court Takes On Unitech, Orders Rs. 15 Crores' Deposit that will be reimbursed to people who bought flats in the developer's projects near Delhi which are nowhere near completion. The Consumer Court has now asked the company to give a compensation of Rs 25,000 to the complainant and refund Rs 4,800 which was the cost of the Hair Oil, after applying the oil the Complainant from Chandigarh lost his hairs. North Goa Consumer Forum awards compensation of Rs. 50,000 to law student for deficiency of services, for the failure on the part of the University to conduct the examination of the course. A well qualified wife who is capable of earning must not remain idle and harass her husband by claiming maintenance, said a family court while rejecting a woman’s plea for maintenance from her estranged husband. Any unmarried couple who lives as husband and wife are to be presumed legally married and in such cases, the woman would be legally eligible to inherit the property of her partner after his death, said a ruling by the Supreme Court of India. Major Reforms in Co-operative Sector for fulfilling the objectives of the National Policy by Adv. R. P. Rathod. The Maharashtra Housing (Regulation and Development) Bill 2012 a Farce or reality Examines Adv. R. P. Rathod. THE DUTIES & FUNCTIONS OF OFFICE BEARERS OF THE SOCIETY BY ADV. R. P. RATHOD. Administrator & Inquiry Officer, Election & Returning Officer, Conveyor & Authorised Officer, Govt. Certified Auditor. Practicing at Mumbai & Thane Region in the field of Civil Laws: Specializing in matters of Property Law, Co-operative Law, Consumer Laws, Drafting & Conveyancing, Taxation, etc. . . . He mentions: "Nobody in this World is perfect, atleast I am not. We are all learners, atleast I am."